In the past 5 years the technology has evolved in a way which makes everything at touch away. These days wireless transfers are done using Wi-Fi. People are trying to come up with new and faster technology like Li-Fi and while its still in the experimental state their is another technology named Gi-Fi which got our interest and here's everything you need to know about it. Gi-Fi is 10 times faster than current day Wi-Fi. Gi-Fi is something you may sometimes hear mentioned with wireless communication, but it's something which few people know about. Yes, it’s an acronym, but not all acronyms have to be scary. Gi-Fi is both easy to understand and can be incredibly useful in the future. Wireless technology improvement has become a follower in today’s modern life. One of the greatest improvements made on wireless technology field was inventing a new Wireless Technology (Gi-Fi). Gi-Fi or Gigabit Fidelity or Gigabit Wireless is the world’s first transceiver integrated on a single chip that operates at 60GHz on the CMOS process. 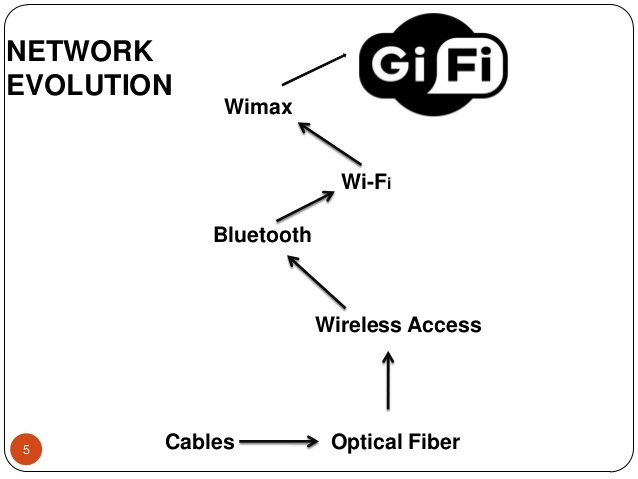 Gi-Fi is a wireless transmission system which is ten times faster than Wi-Fi. This technology providing low-cost, high broadband access, with very high-speed (5 Gbps) large files exchange within seconds. It is required that Gi-Fi be the preferred next-generation wireless technology used in used in home and offices. The main and important component of a Gi-Fi system is its subscriber station which is available to several access points. It supports the standard of IEEE 802.15.3C which uses a small antenna at the subscriber station. For the communication among different computer devices, which includes telephones and PDA, it supports millimeter-wave wireless Personal Area Network. In this network, the antenna is mounted on the roof and it supports Line Of Sight (LOS) operation. It is the world’s first transceiver integrated on a single chip that operates at 60GHz on the CMOS process. There is the use of time division duplex for both transmission and receiving. Data files are upconverted from IF range to RF 60Ghz range by using 2 mixers. The output will be fed be into to a power amplifier, which feeds millimeter wave antenna. The incoming RF signal is first down-converted to an IF signal centered at 5 GHz and then to normal data ranges. Heterodyne construction is used for this process to avoid leakages due to direct conversion. Due to the availability of 7GHz spectrum, the total data will be transferred within seconds. Read Also: Li-Fi is it faster than Wi-Fi ?? The data transfer rate of Gigabit wireless technology is in Gigabits per second. The speed of Gi-Fi is 5 Gbps; which is 10 times the data transfer of the existing technologies. Providing higher data transfer rate is the main invention of Gi-Fi. An entire High-Definition (HD) movie could be transmitted to a mobile phone in a few seconds, and the phone could then upload the movie to a home computer or screen at the same speed. 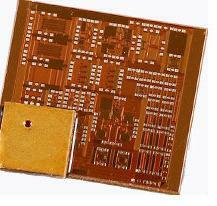 The size of the Gi-Fi chip is 5×5 millimeter and can be placed on different devices such as mobile phones. The chip has a tiny 1mm antenna and uses the 60GHz “millimeter-wave” spectrum. As a large amount of information transfer, it utilizes milliwatts of power only. The power consumption of the present technologies such as Wi-Fi and Bluetooth are 5mili watts and 10 milliwatts but the chip of Gi-Fi uses a tiny one millimeter-wide antenna and it has less than 2 milliwatts of power consumption that in comparison to the current technologies is very less. Gi-Fi is based on an open, international standard. Mass adoption of the standard, and the use of low-cost, mass-produced chipsets, will drive costs down dramatically, and the resultant integrated wireless transceiver chip which transfers data at high speed, low power at low price $10 only, which is very less As compare to present systems. As development goes on, the price will be decreased. As the IEEE 802.15.3C provides more security, it provides link level and service level security, where these features are optional. Point-to-point wireless systems operating at 60 GHz have been used for many years by the intelligence community for high-security communications and by the military for satellite-to-satellite communications. 1. This technology can be effectively used in wireless pan networks, Inter-vehicle communication systems, Ad-hoc information distribution with Point-to-Point network extension, media access control (MAC), imaging and other applications. 2. Gi-Fi technology also can be used in the broadcasting video signal transmission system in sports stadiums and mm-Wave video video-signals transmission systems. The technology could also be used for beaming full HD video in real-time and could be used by notebooks and other computers to wirelessly connect virtually all the expansion needed for a docking station, including a secondary display and storage. 3. Gi-Fi technology has many attractive features that make it suitable for use in many places and devices. 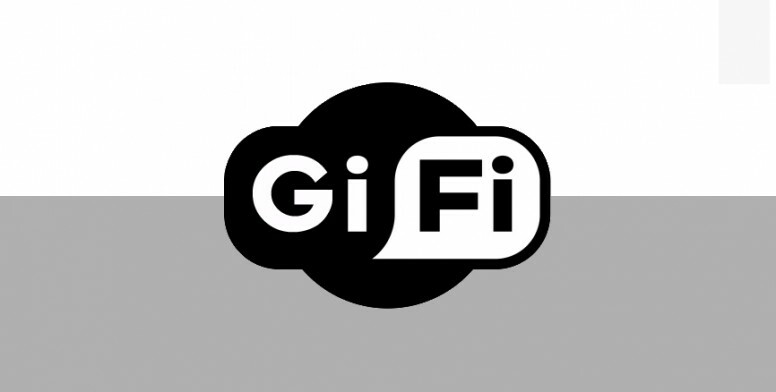 Gi-Fi technology offering reduced the chip size and power consumption, can be used to send and receive large amounts of data in a variety of applications, For example, it is intended for use in a wide range of devices including personal computers, tablets, and smartphones. The technology’s fast data-synchronization rates enable the rapid transfer of video, bringing the wireless office closer to reality. 4. Gi-Fi technology is able to transfer gigabits of data within seconds and therefore it can be used for huge data file transmission and it is expected that this chipset replaces HDMI cables and could develop wireless home and office of future. Without a doubt, Gi-Fi wireless technology represents a considerable improvement if compared to the existing technology. The new technology provides innumerable features that improve both the overall functionality as well as some specific security functions. Thus Gi-Fi can be considered as the technology of the modern era. Also, research should be conducted to increase the range of Gi-Fi since it has a shorter range than Wi-Fi now. The development can enable the truly wireless home and office of the future. Thank you for reading the article, Please share it and follow us for more amazing articles on latest developments in Tech.